Rich creamy rice topped with salty zesty pesto and sweet roasted tomatoes. The perfect risotto without the effort - its amazing! Vegan, GF & healthy. Heat 1 tbsp of oil in a large pan/dutch oven a low medium heat. Add the onion and fry for 5 minutes, stirring regularly, until softened. Then add the garlic and continue to fry for another 5 minutes. Turn up the heat and add the rice. Give everything a stir for a minute or so before adding the stock and a big pinch of salt and pepper. Continue to stir for two minutes or until the stock returns back to a boil. Cover the pan with a tightly fitting lid and bake in the preheated oven for 25 minutes until the rice is tender but with still a little bite. Whilst the risotto is baking, place the cherry vine tomatoes onto a baking tray and drizzle with the remaining olive oil and a pinch of salt and pepper. Roast in the oven for 10 minutes until soft and charred. Meanwhile make the pesto. Add all of the ingredients into food processor and whizz until almost smooth. Taste and adjust seasoning accordingly. Once the risotto is ready, remove from the oven and stir through a generous pinch of salt and pepper. Taste and adjust seasoning accordingly. 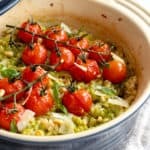 To serve, use a spoon to marble the pesto through the risotto, then divide into bowls and top with a vine of roasted tomatoes and a liberal sprinkle of parmesan cheese, a drizzle of olive oil and a sprinkle of black pepper. If you have one, a dutch oven is ideal to make this baked risotto in. If not, an oven proof saucepan with a lid or oven proof saucepan covered tightly with tin toil will work just the same. This pesto risotto is best served straight away but left overs can be stored in the fridge for up to 2 days. Reheat on the stove over a low heat with a little splash of water. Gluten-Free: Assure your vegetable stock is certified GF. Vegan: Substitute the parmesan cheese with a dairy-free alternative or a sprinkle of nutritional yeast. You can also just leave it off all together - it is just as delicious! Make sure you are using a risotto rice and not just regular short/long grain variety in this recipe. I personally have used arborio rice in this risotto as it is the most readily available. Other risotto rice varieties such as carnaroli and vialone nano will work too. To make my vegetable stock I use 1.5 stock cubes dissolved in boiling water. Personally I like the Kallo Very Low Salt Stock Cubes as they do not contain any added flavourings or preservatives.